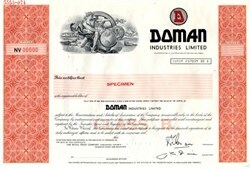 Beautifully engraved SPECIMEN certificate from Doman Industries Limited. 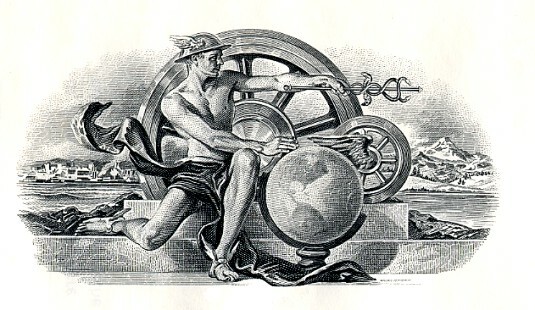 This historic document was printed by the British American Bank Note Company and has a block border with a vignette of an allegorical man wearing a helmet and touching a globe. This item has the printed signatures of the Company's President and Secretary. Doman is an integrated Canadian forest products company and the second largest coastal woodland operator in the province of British Columbia. Principal activities include timber harvesting, reforestation, sawmilling logs into lumber and wood chips, value-added remanufacturing and producing dissolving sulphite pulp and NBSK pulp. All of the Company's operations, employees, and corporate facilities are located in the coastal region of British Columbia and its products are sold in 30 countries worldwide.